Elegant Georgian architecture. Roman ruins. Bustling nightlife and a booming arts scene. Newcastle upon Tyne may sound sleepy, but this English city is quickly catching up to London as a center for culture, art, and trendy restaurants. Situated North East of London on the Northumberland Coast, Newcastle is a contrast in old and new with its rich heritage and up-and-coming status. Newcastle’s history is embedded in places like Grainger Town, the cliffside ruins of Tynemouth Castle and Priory, and the medieval fortress for which the city is named, the Castle. Walk the 73-mile-long Hadrian’s Wall. Hunt for ghosts at Black Gate. Shop the lively Central Arcade and take in the ornate Edwardian architecture of this centuries-old glass domed promenade. See fantastic Georgian structures occupied by department stores and high-street retailers along Northumberland Street and the beautiful Grey Street. Look up to spot architectural oddities like the red-eyed Vampire Rabbit gargoyle, the imposing 20-meter-high Angel of the North statue, and the Tyne, High Level, and Gateshead Millennium Bridges. There's lots to see; luckily Newcastle is compact with many ways to get around. Cycle, walk the banks of the River Tyne, hop on the metro, or grab a ride in an iconic double-decker bus or black cab. Art and theater lovers rejoice! Newcastle packs nearly a dozen galleries and museums, in addition to several theaters, arenas, and music venues. Browse one of the best-curated collections of contemporary art outside of London at the Shipley Art Gallery. Catch a performance by the Royal Shakespeare Company at the Theatre Royal, or throw on Newcastle United F.C.’s colors for a game of footie. All this sightseeing is bound to make you hungry. Mediterranean, Middle Eastern, Chinese, and Indian are all sure bets, but you’ll also find farm-to-table restaurants, upscale British Modern fare, and down-to-earth gastropubs serving hearty pies to wash down with a pint of Newcastle Brown Ale. The city is quickly usurping London’s reputation as the nightlife capital, so save some energy to enjoy bespoke cocktails, live music, and even a bit of dancing. Also known as the “Science City,” Newcastle is home to a state-of-the-art research facility for stem cell research. In the center’s museum, you can enjoy interactive displays that look at DNA and human anatomy, as well a 4D motion ride and dinosaur exhibit. A centuries-old castle and monastery built on a rocky headland that overlooks the Tynemouth Pier. Tour the castle which was rebuilt under royal permission in the late 13th century and walk the ruins of the Benedictine priory where three early kings of Northumbria are buried. The ruins of a Roman fort located in the modern neighborhood of Wallsend, the garrison was built in 127 AD and is located at the eastern end of Hadrian’s Wall. Today you can tour the excavated remains of the fort’s foundation, the reconstructed Roman bathhouse, and a museum that exhibits items found in the excavation. Embrace the medieval charm of Alnwick Castle on a guided exploration that showcases this second-largest inhabited castle in the United Kingdom. Embark on a narrated walk through the medieval streets of Durham to reach the city’s famed cathedral, a UNESCO World Heritage Site. 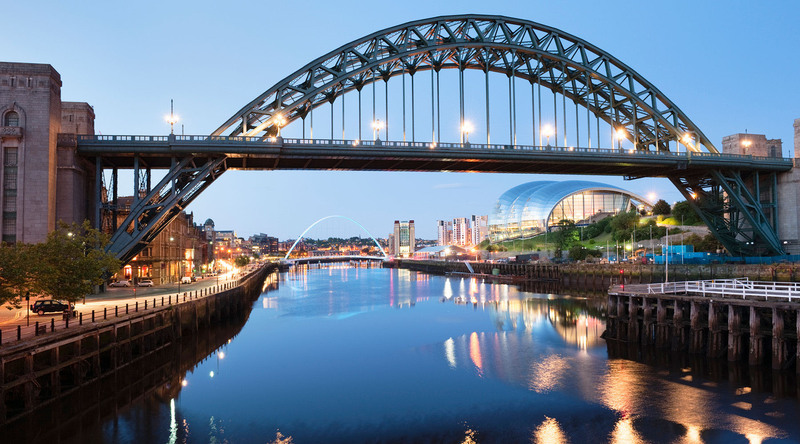 Enjoy a leisurely sightseeing drive that winds through Newcastle and ventures outside of town to witness one of England’s most famous works of art.